Screen shot from Lechler’s online paint selector, with even wheel paints listed. Finding the right color for your old Lancia has always been a challenge. Original period paint samples are quite rare, and even they have faded with time. Another way is to find some hidden bit of original paint on your car, not aged in daylight, and use that to establish the paint color, but that is not so easy either. Ideally, someone has researched the historic Lancia paints. Paints for the 1960s Lancias were listed in the workshop manuals, and for the Flavia and Fulvia, the paint colors are more readily accessed. However, Lancia was in the process of changing paint systems at the time, and some of their favorite paint manufacturers, Max Meyer, do not have cross-indexing to other more current paint manufacturers. Its even harder for the older cars. In 1990, Lechler (a European paint company) published current paint codes for vintage Lancias. That list was a key milestone in efforts to reconcile past and present paints and can be found elsewhere on this blog (search under “color”). However, Lechler paints are not available in the US (the one Canadian distributor is non-responsive) and so there is no way here in the US to know if their new paint colors truly match up with the older paints. Since then, the paint world has made some strides. 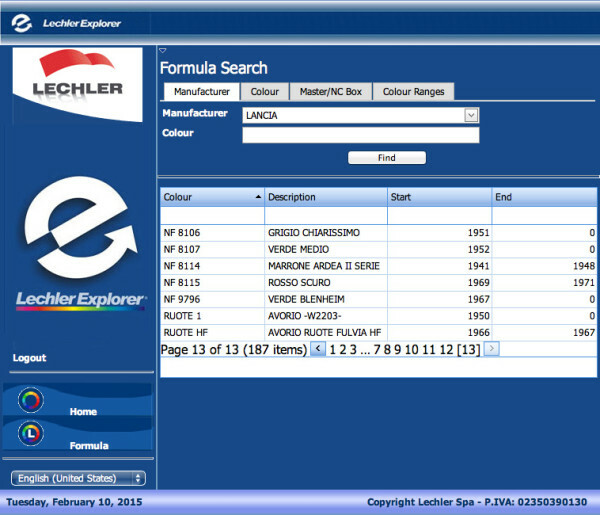 Lechler has now made their vintage paint selector available online. Go register on their site, type in Lancia, and up pops a wide list of paint colors used on Lancias. They give dates for when the paint color was used, and they look reasonable at first glance, but no guarantees. Its complicated, but its possible to get the paint mix from this site. Again, I’ve never seen a Lechler paint sample, so I have no idea how close it is to the original, but you can even order a spray can of it, and try it out. Glasurit has long been active in paints and has a good US presence. THere are a few Glasurit paint chip cards around from the 1980s that list paints (and in some cases, even a formula) going back to the 1960s. Its still a bit tricky as Lancia used different mixes for some of their standard colors (even for Lancia blu) so you have to pick the right one for your car. Glasurit now publishes their paints for vintage cars online also. Their site is tricky to navigate, with over 100 paints listed, but for many its possible to get the color formulas. In some cases, multiple listings are provided for a color (for different eras) reflecting that they too (like Lechler) are aware that the original color formulas were modified by Lancia over the decades. There are three things to look for in the new paints: color and sheen (level of shine) are most widely understood. However, one more factor, the depth in the look, should be taken into consideration. This last one is probably a function of the paint system but its worth considering when you are thinking of new paints. When urethane paints first came to the market, early applications were rather thick and didn’t look right, but by now, a skilled applicator can make them really look much closer to the original so that their use is not a problem. They aren’t quite as deep, nor lay as thin as the old nitro-cellulose lacquer, but they are available, durable and easily repaired. I have this on my B20 and am quite happy with it.